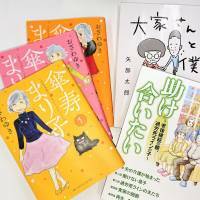 Japan is starting to embrace a new genre of manga featuring elderly people as the leading characters. “Sanju Mariko” is a story about Mariko, a widow and writer who at the age of sanju, Japanese for 80, sets out from the home she has shared with her son, his wife and extended family, including her great-grandchild. Her new life begins as an “internet cafe refugee” after she is unable to secure other accommodations. The decision to leave home is prompted by a feeling of alienation brought on by disagreements with her family over a plan to rebuild the house she had thought would be her final home, as well as a sense of loneliness after learning that a friend has died alone. She even ponders whether her family is hoping that she’ll die soon. The story incorporates a variety of problems elderly people might encounter, such as driving the wrong way on a highway or having their home turned into a “garbage dump” by hoarding items they consider treasures and do not want to part with. Other themes in the work include love affairs between the elderly and the onset of senile dementia. “Sanju Mariko” has been serialized in Be Love, a manga for women published by Kodansha Ltd. since 2016. As an independent comic book, the seventh volume is due to be released this month. Kodansha has received comments from many readers in their 40s and 50s who say the tale strikes a chord with them as they imagine they themselves might experience similar situations as they get older. But while Mariko worries about her situation, she also stays positive and actively pursues new challenges as she forms relationships with others. Mariko “in a sense is my ideal and I feel as if there will be more elderly like her,” Ozawa said. “Oya-san to Boku” (“The Landlady and Me”) is another popular comic book in the genre, based on the life experiences of Taro Yabe, a 41-year-old comedian who lodges on the second floor of a house in Tokyo owned by a woman in her late 80s. The landlady divorced when she was young and lives alone in the house until Yabe moves in. The two develop a warm and personal relationship. Yabe’s story has drawn a large following, with 410,000 copies having been published by Shinchosha Publishing Co. Many readers in their 30s and older write that they “yearn” for such a relationship. To them, the landlady, who finds a happy daily existence through sharing warm moments with a person from the younger generation, seems to represent their ideal image of an elderly person. “Tasukeaitai: Rogo Hatan no Oya, Karoshi Line no Ko” (“A Wish For Mutual Help: Parents Broken After Retirement, Offspring on the Verge of Death From Overwork”), published by Akita Publishing Co., is a manga about a married couple in their 70s. After retirement, they experience small daily pleasures such as gardening, but the husband suffers a stroke and finds himself in need of nursing care. As a result, the couple and their children are driven into a corner, both emotionally and financially. 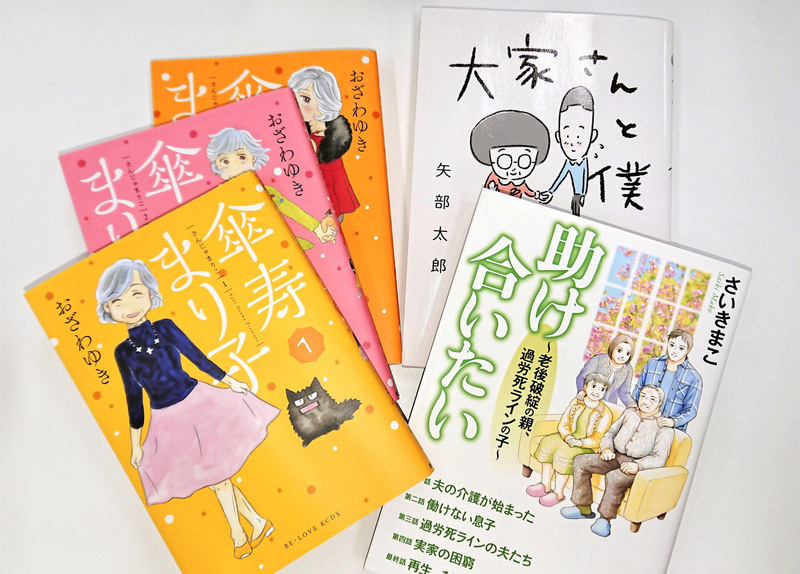 The popularity of manga with elderly central characters appears to reflect anxieties shared by all people about how to make post-retirement life meaningful and cope with nursing care and other issues unavoidable in old age. These stories allow readers to identify with such characters and think about social problems they themselves will face in old age, and consider the ideal model for the elderly, experts say. “Manga magazines have changed in content along with the aging of generations who were acquainted with them in childhood,” said Kyoko Tominaga, an associate professor of sociology at Ritsumeikan University.